Idris Elba is a scary black man. Okay, not really. But, he looks like one, and that’s just as bad. And before you call me racist, let’s talk about this. 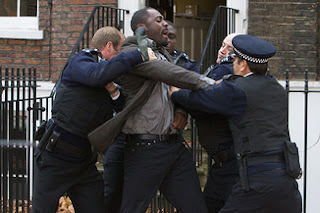 Idris Elba is the star of Luther, a phenomenally complex and twisted BBC crime drama that follows John Luther (played by Elba, obviously) as he tries to solve cases, get back together with his wife, and figure out why this murderer is so obsessed with him. Oh, and also try to control his overwhelming temper and bad habit of using excessive force on criminals. The show’s absolutely brilliant. Well acted, well directed, and well written. And yet, no one on this side of the ocean seems to know it very well. It’s available on Netflix, and it’s just as good as Sherlock. So why don’t we know it? And furthermore, why isn’t Idris Elba a bigger star? Elba, whose career really got going when he played a philosophical drug dealer on The Wire, is an amazing actor who can play a huge variety of roles. He’s been mentioned as possibly being the next Bond, which would be rad, appeared as Heimdall in Thor, and will be lighting up the screen in next week’s Pacific Rim. But for some reason, we don’t really know his name as well as, say, Benedict Cumberbatch. Okay, I get it. The internet is obsessed with Cumberbatch, because he has a funny face and does nerdy projects they love. But why can’t we be obsessed with Elba too? He’s fabulous, a great actor, and much more attractive (to me). Well, I’m pretty sure it’s because we’re all a little bit racist. There is a fundamental difference between Luther and Sherlock, and it isn’t the fact that Sherlock is based on an existing and immensely popular story, while Luther is entirely original (and just as good). The real difference is this: John Luther is threatening. Sherlock Holmes isn’t. The Sherlock of BBC’s Sherlock is a prissy dandy, who just happens to be smarter than everyone else in the room. Sure, sometimes he shows admirable fighting abilities, but never in a way that makes you uncomfortable. He’s always funny or snarky or clever, but never unlikable. John Luther is unlikable in literally his first scene. You see, when you meet John Luther, he’s dangling a murderer from a bit of scaffolding and stepping on the guy’s fingers while he demands to know where the rest of the bodies are. The other police officers are on their way. And then? The guy falls. And John Luther gets suspended from the force. That’s how the show starts. It’s not exactly uphill from there. He’s confrontational with his wife, who’s leaving him. He’s a bit of a menace at work. He isn’t emotionally stable, or really entirely sane, but he’s a damn good detective, and once you realize that he’s doing his serious level best to hold it all together, you learn to love him. You don’t always like him, and you definitely don’t always agree with him, but you love him. Unfortunately, he’s still an angry black man, and we, as an audience, don’t seem to dig that. 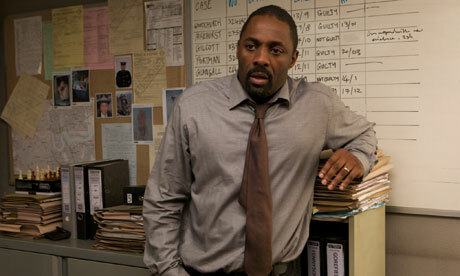 Look, John Luther is an amazing role, and Idris Elba plays him to absolute perfection. He’s brilliant. I love this show. I love it so much it hurts a little. But I know why it isn’t more popular. And it kills me. Because we’re afraid of him. 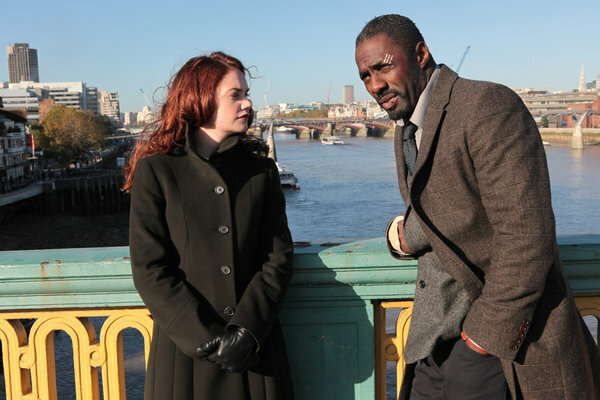 We’re afraid of John Luther, and that makes us afraid of Idris Elba. If Luther starred a white guy, it would be more popular over here. I guarantee it. If Pacific Rim fails at the box office next week, they're going to blame it on having a non-white main character. And it still kills that over here Elba is best known for playing a drug dealer. I don’t have a solution here. I wish like hell I did. But I don’t. I don’t know how to make Americans less afraid of the mythical “angry black man.” It doesn’t really do anything to know that John Luther isn’t actually dangerous, that while he was framed for murder, he never did anything to warrant it. That he’s blustery and scary, but really only to very bad people. That his wife loved him. That the reason that murderer is so interested in him is because he loves so deeply and so openly. We don’t see that when we look at him, do we? No. We see an angry black man.